We like to learn about the places we travel to and a visit to the country’s museums can often be a good way to do that. However in many areas of the world which are not as affluent as Western / Northern Europe, exhibits can sometimes be a bit tired or dusty, with difficult to read translations, if any. 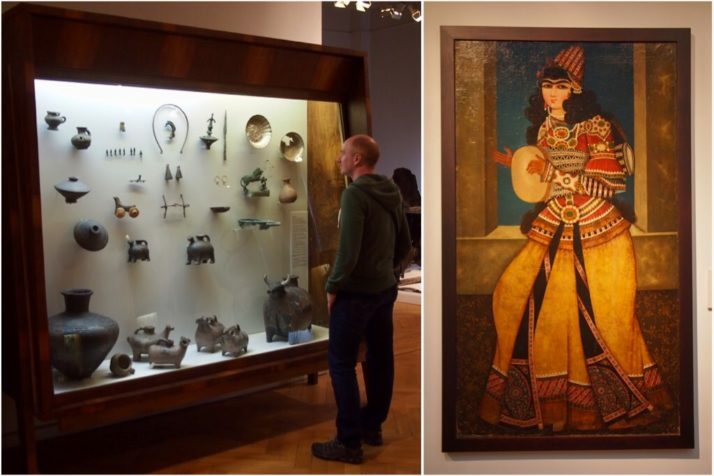 But not so in Georgia, we were consistently impressed by the quality of the museums with well laid out displays, professional lighting and coherent and informative English labelling. The centre piece museum is without a doubt the Museum of Georgia in Tbilisi. 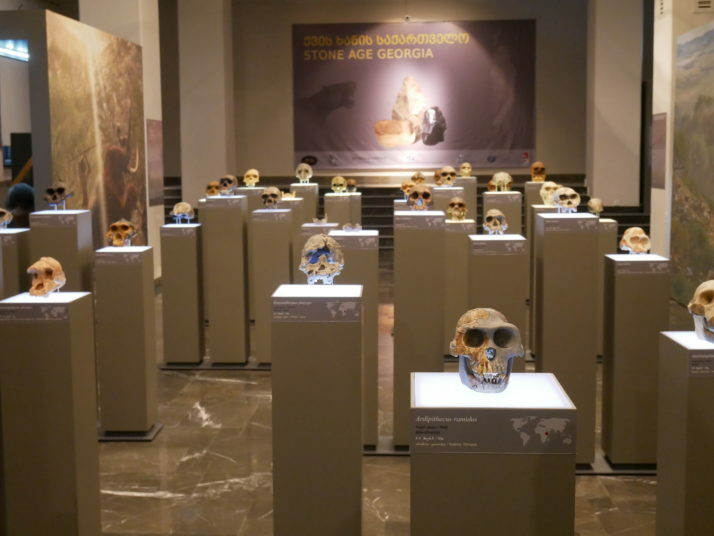 The exhibitions ranged from Asian art to Georgia’s time under Soviet occupation to a fascinating gallery filled with skulls and skull fragments of human ancestors from the Stone Age. 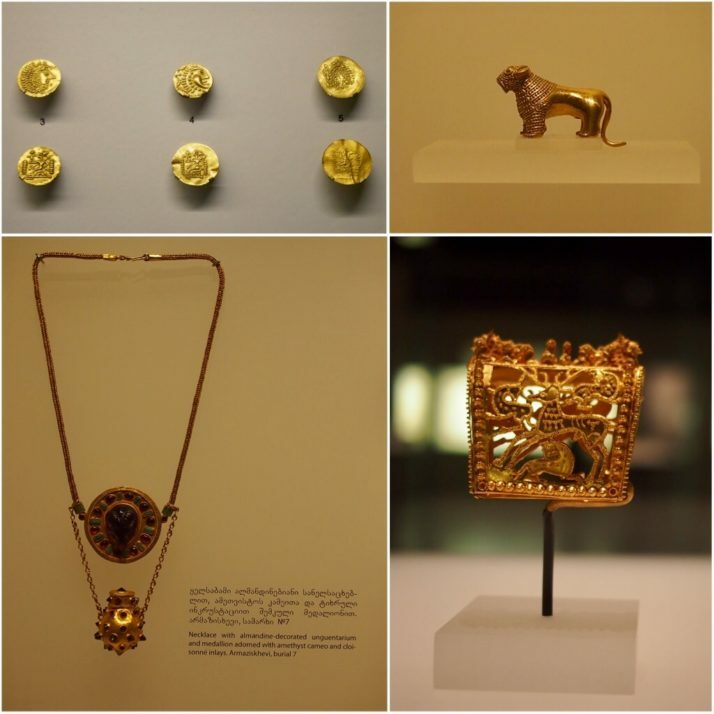 But the standout exhibit has to be the Archaeological Treasury filled with beautifully made golden grave goods from burials excavated in Georgia and dating back to the 3rd millenium BC. The side room containing the numismatic treasury was cleverly set up with two examples of each coin (where possible) one showing the face and the other the reverse. 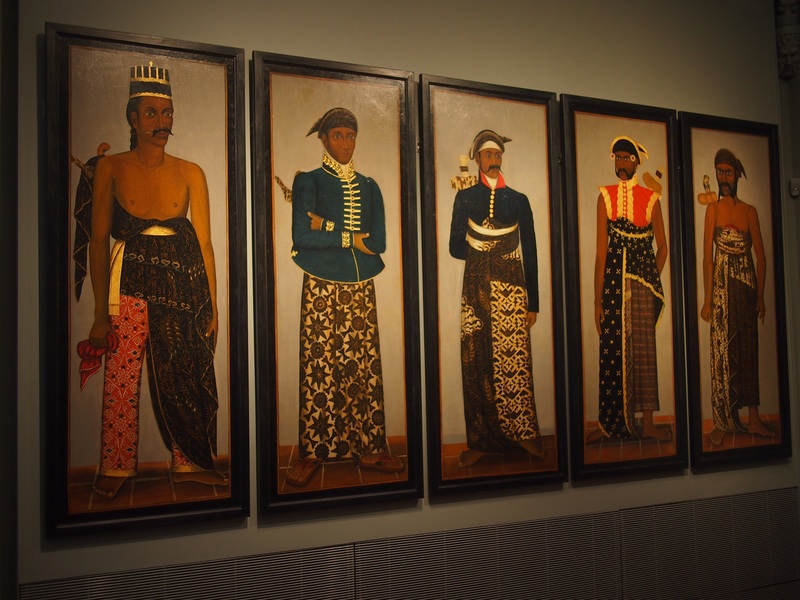 The regional museums had nice twists showcasing what is special to their area of the country. 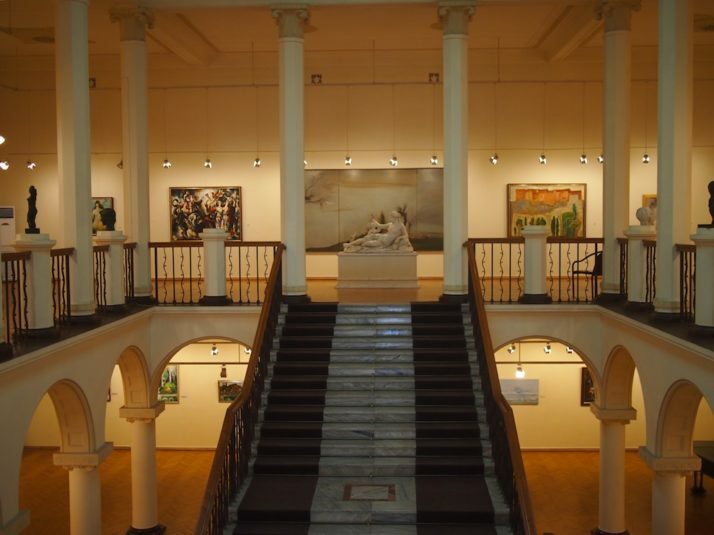 The museum in Sighnaghi had a fairly standard exhibit of the archaeology and development of the area, but upstairs was a gallery of paintings by locally born national painter Niko Pirosmanashvili, also known as Pirosmani. We saw more of his pictures along with other Georgian artists in Tbilisi’s National Gallery. 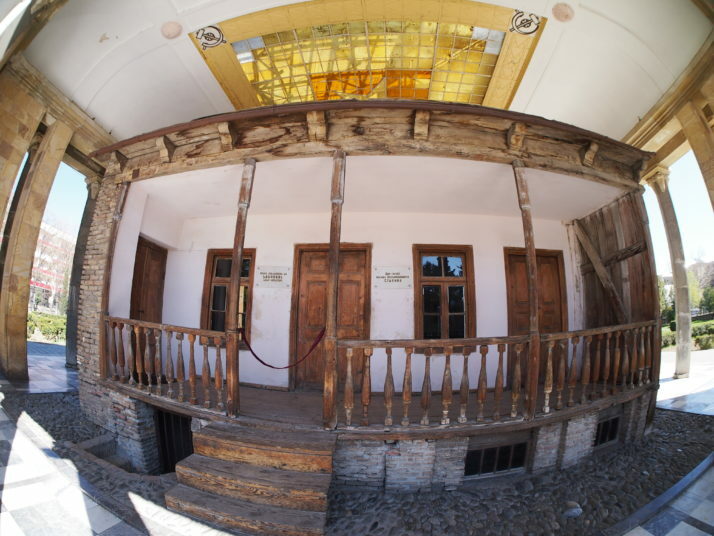 In Svaneti the museum in Mestia is recently reopened in a state of the art building and displays many treasures from the region’s churches alongside culturally specific Svan items including clothing, weapons and local crafts. 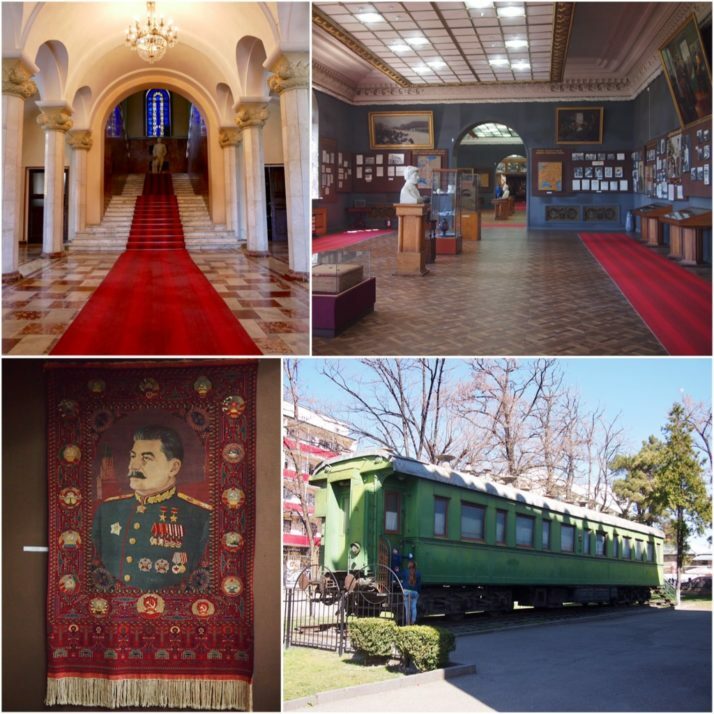 The final museum that we visited in Georgia is not under the aegis of the Georgian National Museums body, it is devoted to the country’s most infamous son, Josef Dzhugashvili, better known as Joseph Stalin. 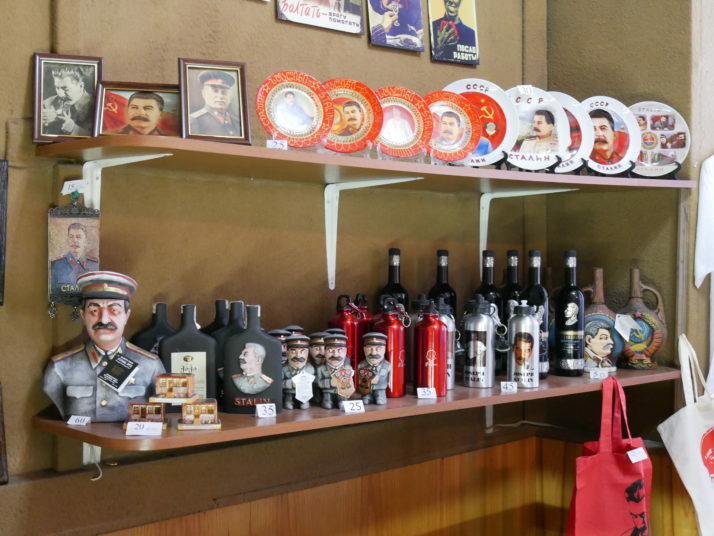 Stalin was born in Gori, 80km west of Tbilisi, and the museum contains the house where he was born and spent the first four years of his life, preserved on the spot where it originally stood, covered by a pavilion adorned with a Soviet hammer and sickle. The custom built museum is rather grand but slightly shabby and very cold, reminiscent of the Museo de la Revolucion in Havana. Its construction was actually started in 1951, two years before Stalin’s death, but didn’t open until 1957. The displays were not particularly well signed but the whistlestop guided tour (included in the admission fee) was good at highlighting notable artefacts and giving an overview of the arc of Stalin’s life. For a man who is generally reviled in the west, it was strange to be in a place where the atrocities commited during his time in charge of the USSR are hardly acknowledged, the small corner devoted to those who died under his rule felt like a very token effort. This entry was posted in Places and tagged Art, Georgia, Gori, Mestia, Museum, Sighnaghi, Stalin, Tbilisi on June 8, 2017 by Julie. 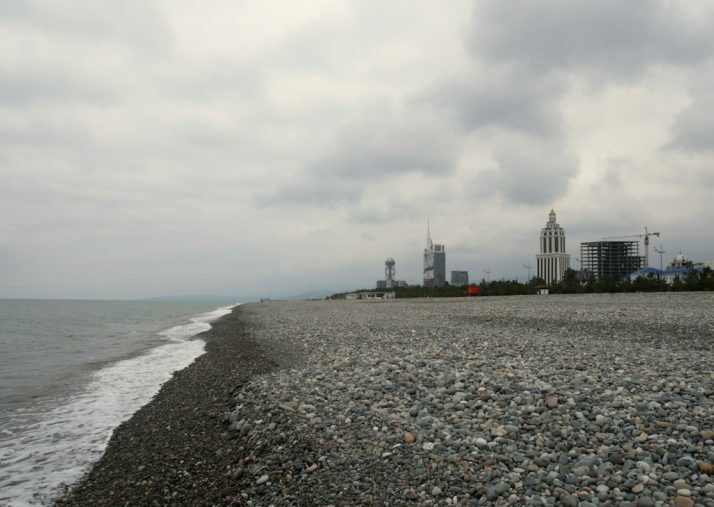 When we were planning our trip to Georgia I’d wanted to include some time in the Black Sea beach resort city of Batumi even though Julie, Jo and I aren’t really beach people, and by that I mean that we prefer a hike, city walk or good museum to a sun lounger. Not that sunbathing was on the cards in late March as it would have been far too cold! 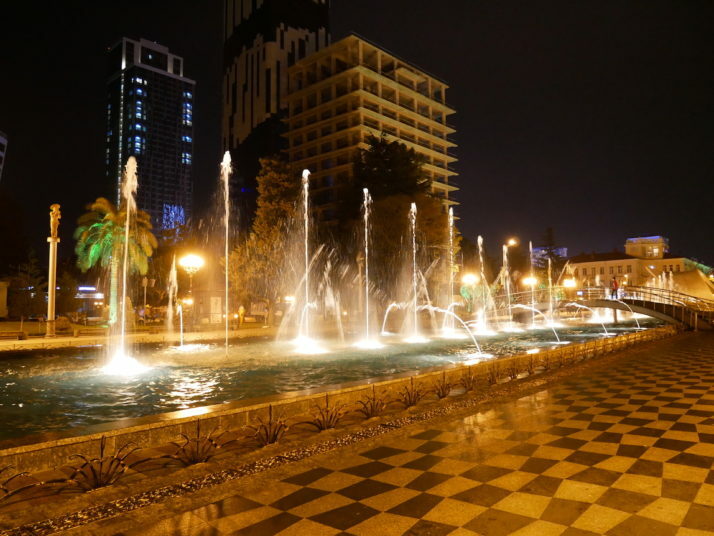 With much of the same reasoning behind hiring a car in Armenia, having picked up another in Kutaisi meant it was easier to justify a couple of nights in Batumi as there were a few sights we’d read about that piqued our curiosity, such as the Black Sea Boulevard, a tower with a ferris wheel at the top (how does that work? – we had to find out!) 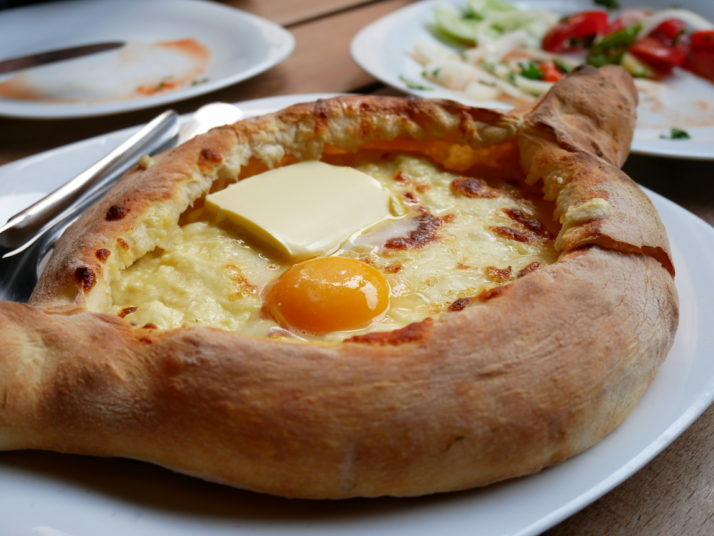 and the region’s khachapuri speciality is the iconic bread-boat filled with cheese and topped with an egg. Much like Naples being the home of pizza and serving the best we’ve had, would this be our home of khachapuri? 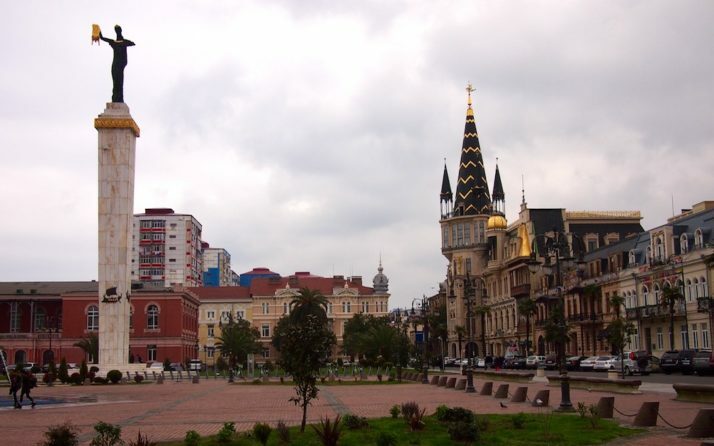 Batumi is the third largest city in Georgia and it is easy to see that the laid back vibe is popular with Georgians, Armenians, Russians and Turks alike. Accommodations a-plenty (and really cheap off season) running the whole spectrum from self-service apartments to international luxury hotel chains and they’re building new apartment blocks at an impressive rate too. We started our tour of the city in the respectfully renovated Evropas Moedani or Europe Square, consisting of lovely two-tone brick buildings set around a large open square with one of those ground-squirting water features you can play chicken with and a tall statue of a woman holding a golden fleece. Why’s that you ask? So the story goes, Jason and his 49 Argonauts sailed past Batumi, along the Rioni river a little further up the coast and inland to Kutaisi where they took the Golden Fleece from a dragon. 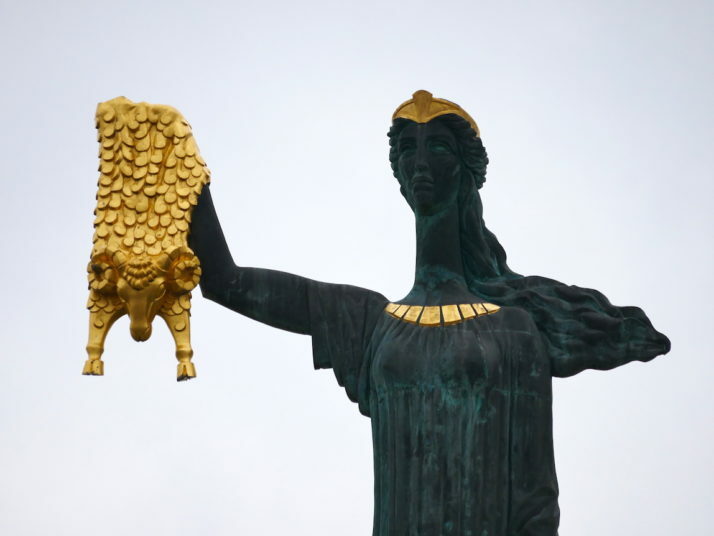 The legend of the Golden Fleece is based in history: Georgians used sheepskins to sift for gold in mountain rivers! Working our way towards the coast we stopped at the Adjara Arts Museum, a nicely sized gallery with a varied collection of Georgian, Russian and European artwork, followed by the Cathedral of the Mother of God in an imposing Gothic Revival style that the Soviets had previously repurposed as a high voltage laboratory! 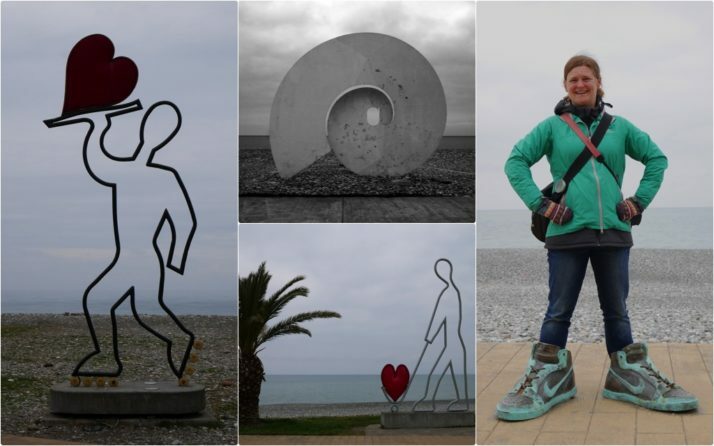 Batumi’s main attraction is the 6km coastal boulevard, a wide promenade with separate cycle lanes and lined with large, quirky art on the coastline side and impressive hotels and apartment blocks on the other. 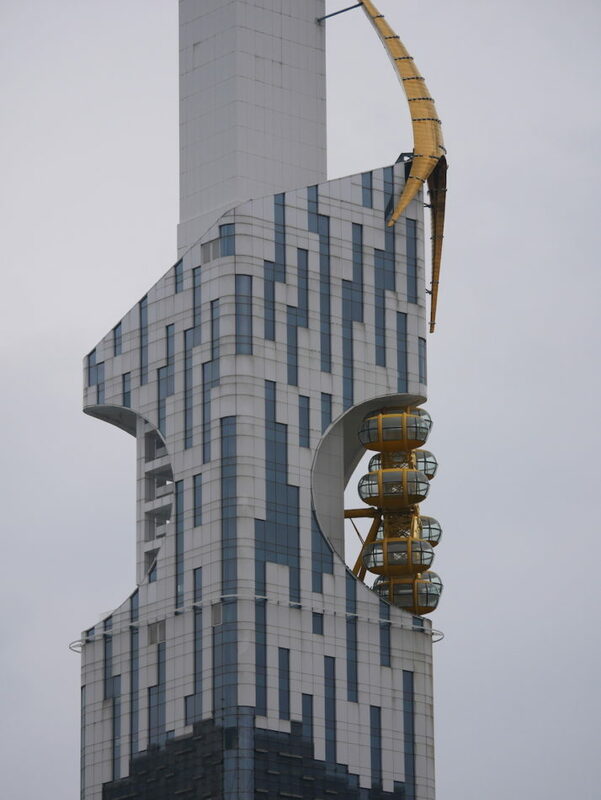 Crescendoing at the northern end is a wide open space dominated by a large ferris wheel, the other ferris wheel I mentioned earlier that sticks out of the 13th floor of the Batumi Tower – the tallest building in the country – and a monument to Georgian script and culture called the Alphabet Tower. 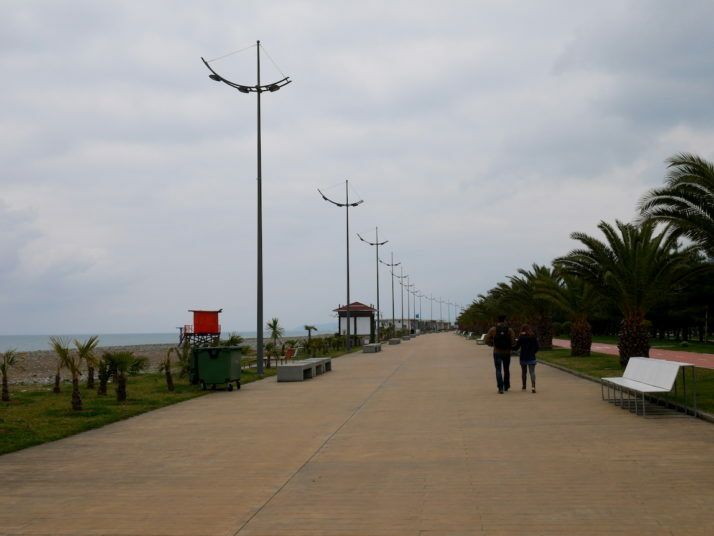 Batumi’s Boulevard. We reckon it’ll be a lot busier when the weather’s nicer..
There’s just as much to see at night too, the most impressive illuminated artwork being Ali & Nino (centre) who change colours as they pass through each other! A special mention goes to the dancing fountains that our guidebook said wouldn’t be running this early in the year so we were very pleasantly surprised when we stumbled upon them. We’ve seen a few water displays set to music and lights before, but these were by far the most coordinated. At this point in our travels around Georgia we’d accomplished our side quest of trying all of the styles of khachapuri, the country’s national dish of bread and (typically) cheese. 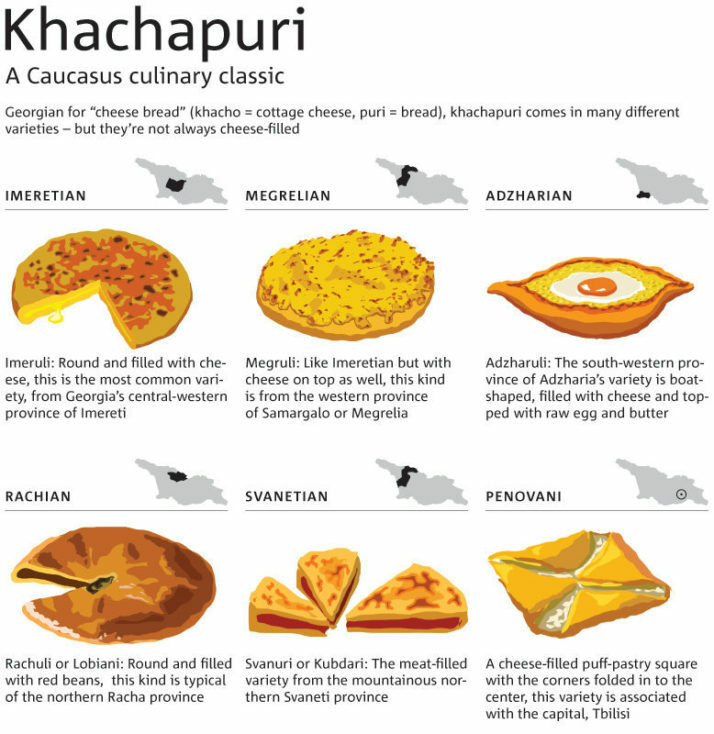 As mentioned, the western region of Adjara is home to the most iconic of khachapuri styles – the Adjaruli khachaphuri.. The Adjaruli – a bread boat filled with molten cheese topped with an egg and an generous knob of butter. Genius. While the Imeruli and Megruli are available across the country and almost all varieties can be found in Tbilisi, we can confirm that just as for pizza in Naples, the local pride in Batumi makes for the tastiest of the tasty khachapuri. Honourable mention and a close second goes to the meat-filled kubdari we watched being skilfully made in Ushguli. This entry was posted in Places and tagged Art, Batumi, beach, Cathedral, Cheese, Food, Georgia, Museum on June 3, 2017 by Andrew. Like most capital cities, Havana has a wide variety of things to see. Andrew has already written about his highlights, here are mine. 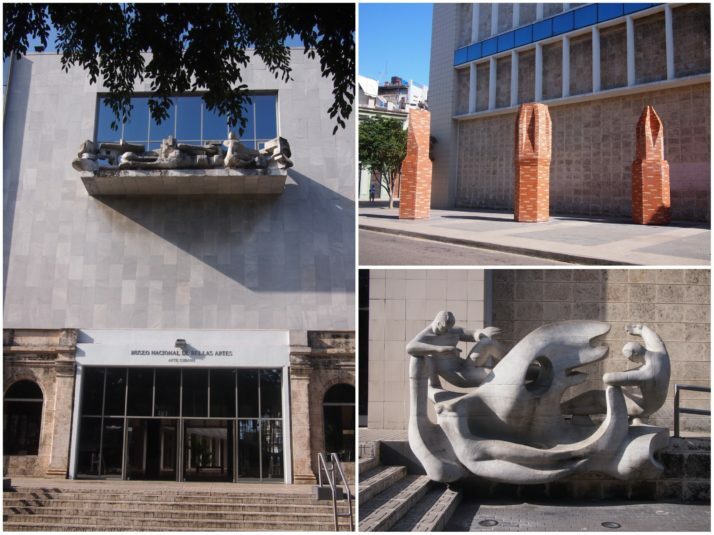 Cuba’s Fine Art Museum is spread across two buildings in Centro Havana, one dedicated to Cuban art and the other to international art. We visited the Cuban building first and I was blown away by the quality and variety of the works on display. 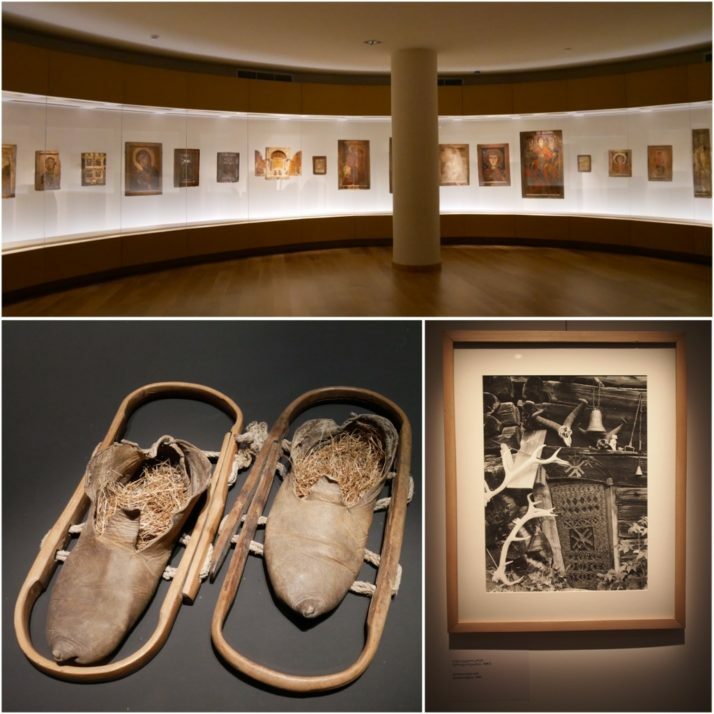 The exhibits are arranged chronologically, the first few rooms are dedicated to colonial art with some arresting portraits, landscapes showing the countryside and life in the past with a few maps thrown in for good measure. 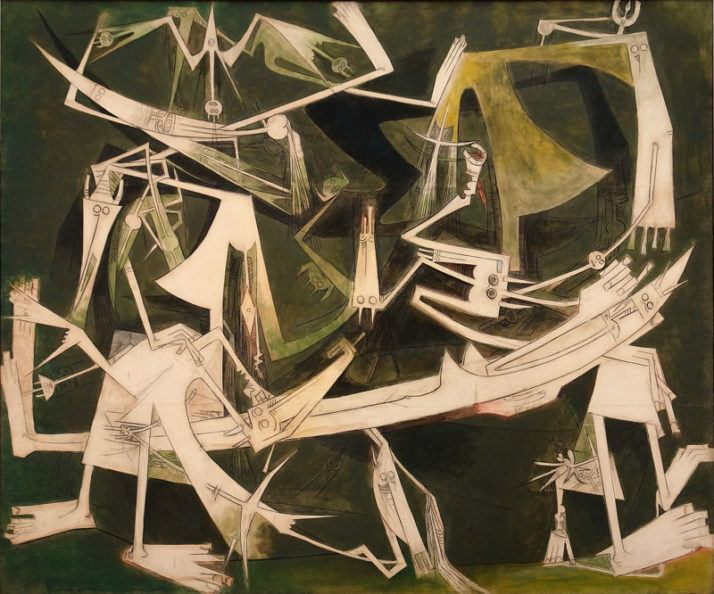 The rest of that floor (about three-quarters of it) shows how art progressed in Cuba from the late-19th to mid-20th century – this was my favourite part, I especially enjoyed the satirical cartoons of Rafael Blanco and Wilfredo Lam’s paintings which reminded us of Picasso. The second floor exhibits works from the mid-20th century through to the current day, also worthwhile but by that point we were starting to get museum fatigue (and hungry!) so probably didn’t enjoy them as much as we might have done. 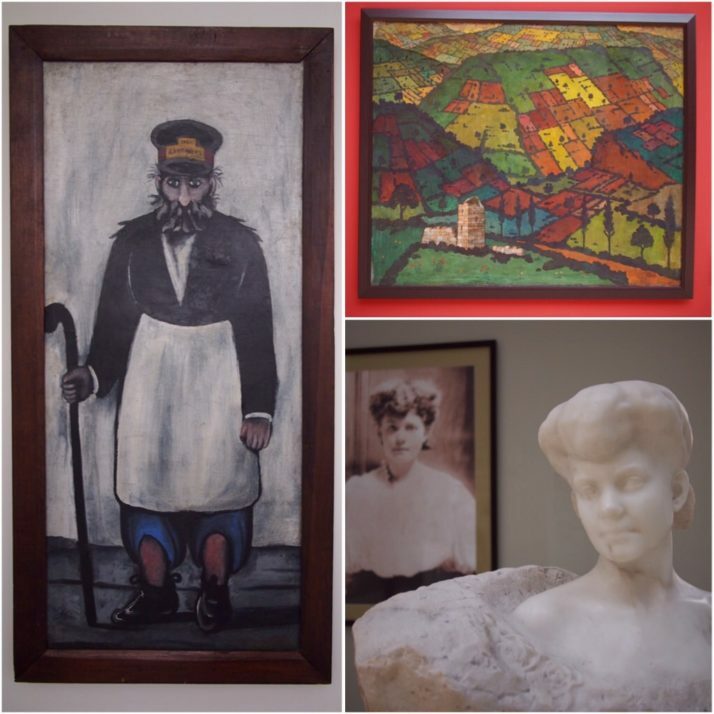 Having refueled in a nearby cafe, we spent the afternoon in the international building and found the display of mostly pre-20th century European and Latin American art to be a bit lacklustre after the Cuban works. The stained glass ceiling in the central stairwell was spectacular although we worried about whether it would survive as it was in desperate need of renovation and the building seemed to be crumbling around it. 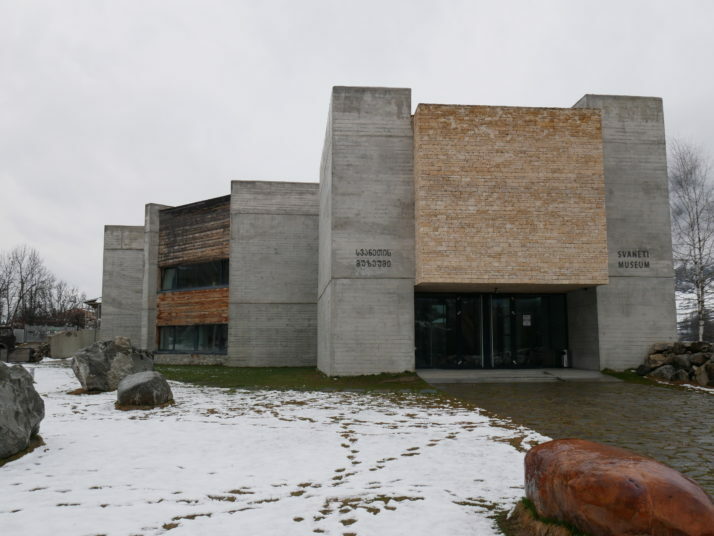 Also in this building was a temporary exhibition by Francis Alÿs, mostly video installations covering the time he spent embedded with the British army in Afghanistan, immigration across the Straits of Gibraltar and his attempt to create a ‘bridge’ of boats stretching from Cuba to Florida. In search of more art, one day we made the long journey out to Jaimanitas on Havana’s western fringe to visit the home and workshop of José Fuster. Our guidebook suggested we take a taxi but we were sick of haggling prices and still feeling like we were being ripped off, so we took a chance on a local bus. We perhaps should have been a bit better prepared with landmarks around where we were supposed to get off but we managed OK and after a one hour bus journey (total cost MN4 = £0.12) and a 40 minute walk along a shady road we arrived feeling slightly smug. 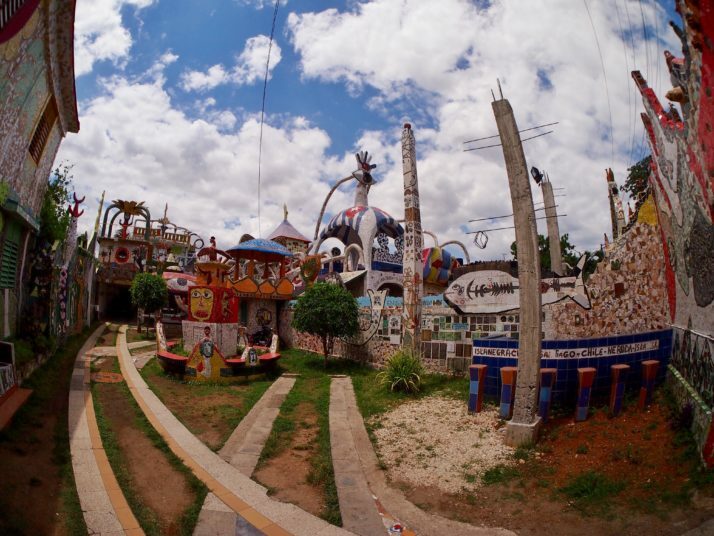 Fuster has turned not only his home but half of his neighbourhood into something reminiscent of Barcelona’s Park Güell (created by Antoni Gaudí) with lots of organic forms and bright tiles covering every surface. 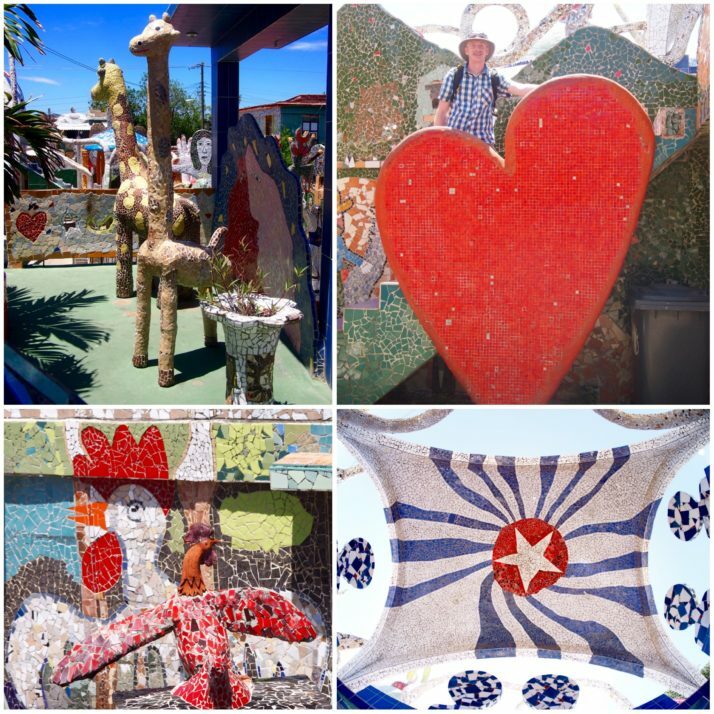 We loved wandering the nearby streets checking out the colourful buildings and decorated walls, there’s even a tile covered unicorn! When we arrived Fusterlandia itself was closed for lunch but at 2pm we were able to go in and explore. 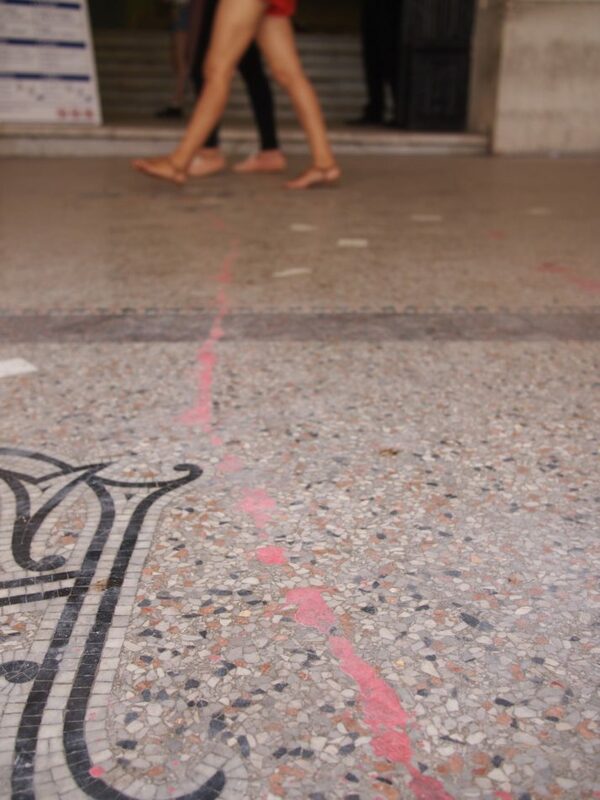 It’s an overwhelming experience with seemingly every available surface covered in tiles, and every time we turned we spotted something new. 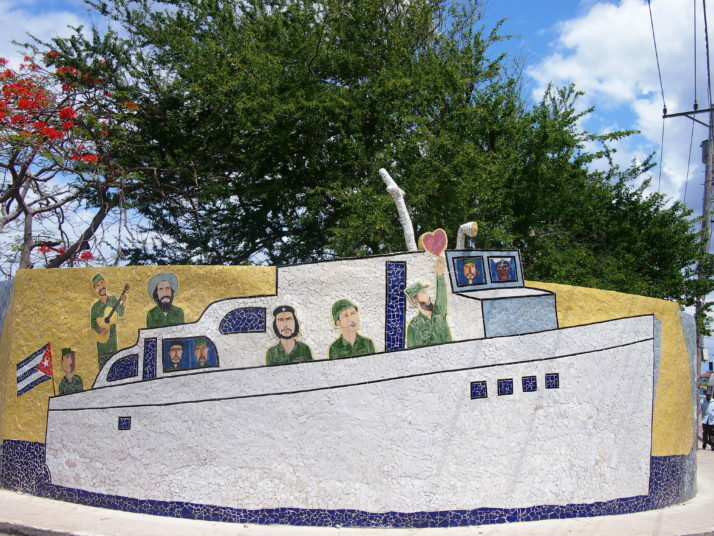 There are lots of animals, cockerels especially appear very often, as well as hearts, a mermaid and a pavilion in honour of the Cuban Five. 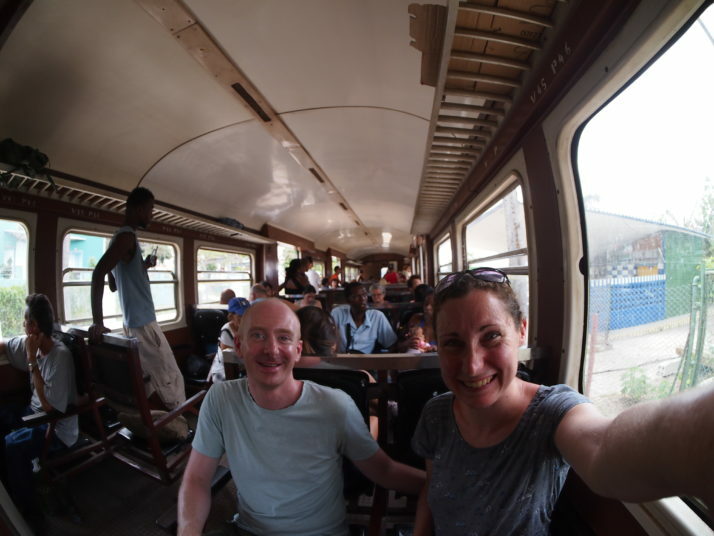 We love travelling by train but it turned out to not be a straightforward way to get around Cuba – the rail infrastructure is not very good and the schedules are unreliable. 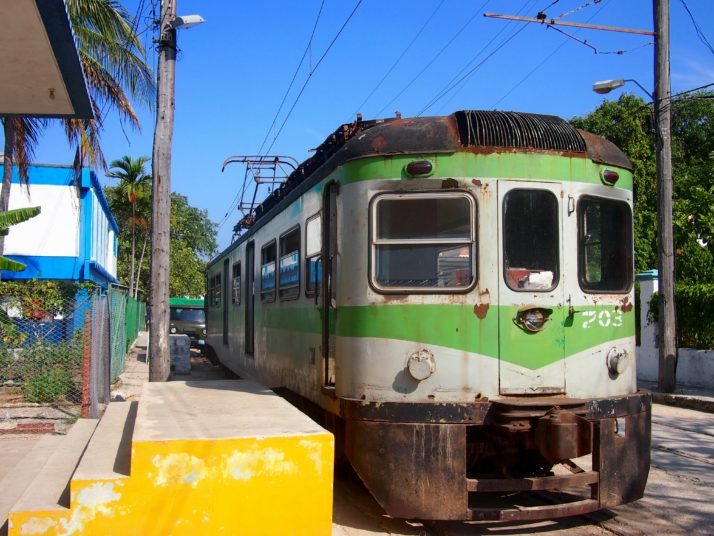 In fact the only train that we travelled on was the electric line from Havana to Matanzas, though we got off midway in the small town of Camilo Cienfuegos (aka Hershey). I don’t want anyone to get the wrong idea, this electric line can not be compared to Japan’s shinkansen, or even the East Coast Mainline back in the UK, it’s an old interurban train – basically a very rickety tram! The line was built in 1921 by American chocolate tycoon Milton Hershey to link his sugar mill (in the town then known as Hershey) with Havana and Matanzas. Before the Revolution the sugar produced here was shipped to the US to be turned into chocolate, but in 1959 the factory was nationalised (and the town was renamed after a revolutionary hero) and it feels as if there hasn’t been much maintenance to tracks or train since then, although actually the trains were replaced with second-hand Catalonian ones in the 1990s. It’s rusty and dilapidated and bumps and clangs along stopping at dozens of little ‘stations’ (imagine a concrete bus shelter next to the line and you’ll be about right) along the way. 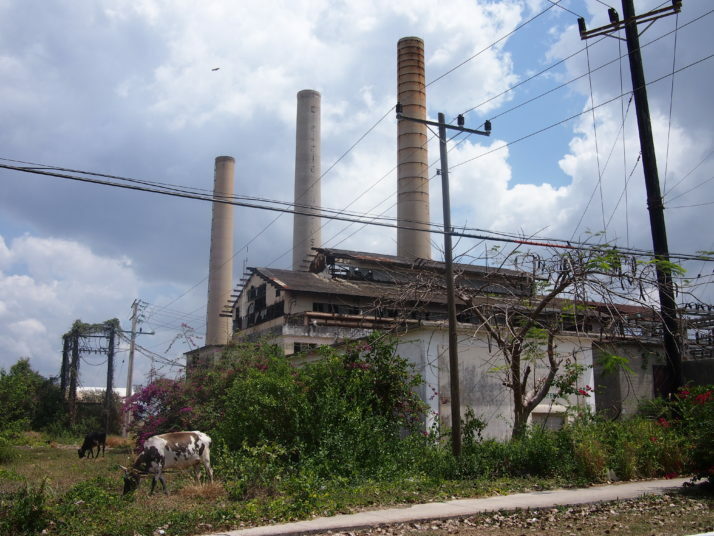 The sugar mill ceased production in 2002 and its rusting ruins dominate the sleepy town. We had a bit of a poke about and took some photos being careful not to cross the ‘Danger No Entry’ signs. While there we met an American father and son, Fred and Justin, who’d also travelled in on the train. After taking photos of the mill we still had 3.5 hours to kill before the train back so we headed 1km north of town to the only other ‘attraction’ in the area, the Hershey Gardens, basically a rather overgrown pleasure ground with some woods, a pool for bathing and a couple of restaurants. 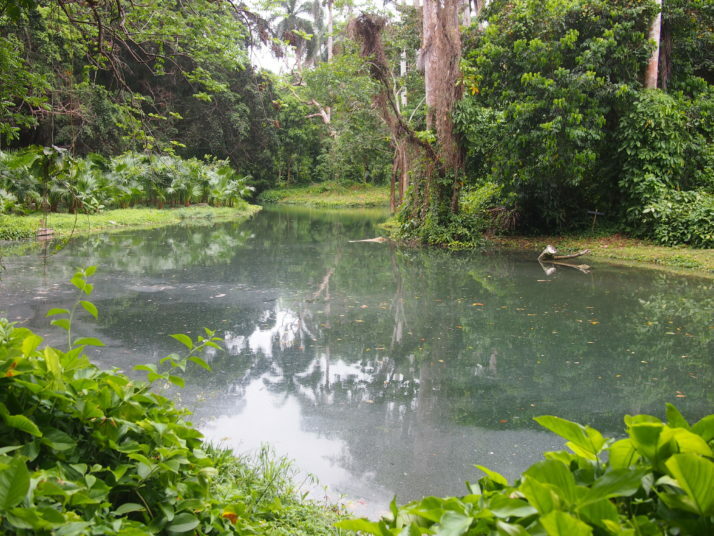 We ate lunch with Fred and Justin swapping traveller’s tales over papaya juice while we waited for the food, before setting out to investigate the rest of the gardens only to discover that there wasn’t much to explore. The path wound along the river a little way to the pool where several local families were picnicking and cooling off in the water before coming to an end at a fence just a couple of hundred metres into the wood! 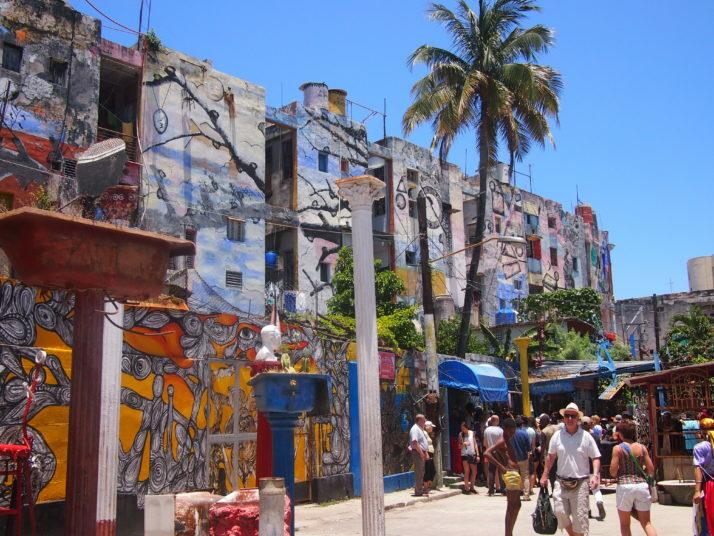 Tucked away off a quiet back street in Centro Havana is the Callejon de Hamel, an alleyway covered in artworks and host, at 12pm every Sunday, to a live rumba session. We thought it might be a show for tourists but there were at least as many locals there and the first band of musicians and dancers performed for an hour and a half! The drumbeat throbbed and everyone was clearly having a great time. Absolutely superb! We thought the tour was a bit overpriced at CUC$10 (£7) each for a 30 minute visit and we were very disappointed that we weren’t able to take photographs of the factory floor, nevertheless our guide Marisela was very knowledgeable and we had a small group so it was easy to get a good look at what was going on and ask questions. 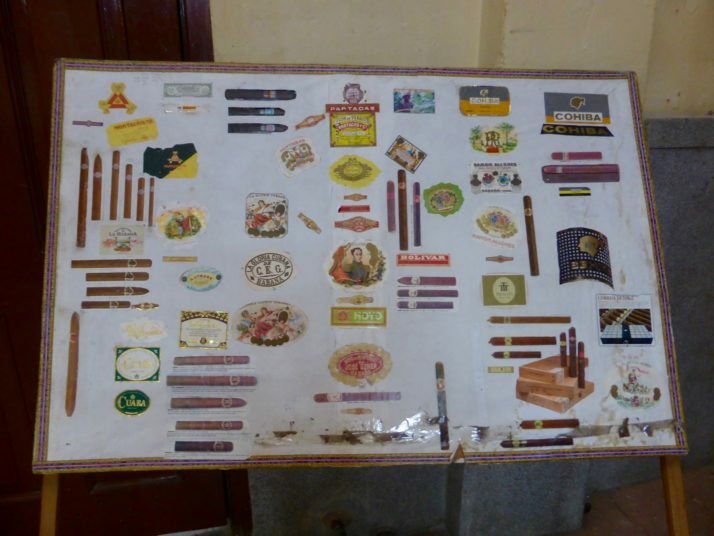 First she explained how tobacco plants are grown, and the different types of leaf which are needed to make each cigar (for flavour, strength and burn quality) as well as leaves from shade grown plants which are more flexible, almost stretchy, and used for the binder and wrapper. 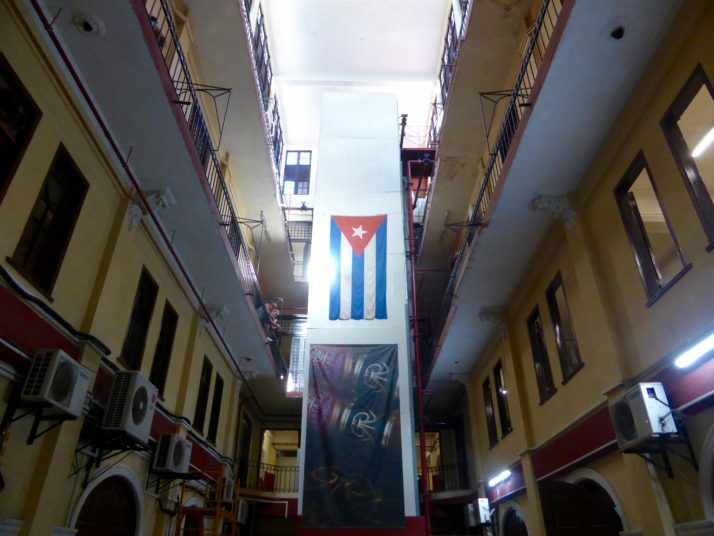 Next we were taken up to the third floor where we could see the cigars being made. The workers were a mix of men and women across a wide age range and seemed friendly, smiling and winking at us as we peered in from the doorways and Marisela dashed back and forth bringing us samples to look at and smell. It is a highly skilled job and each worker must pass a 9 month training program before they can begin producing sale quality cigars (the practice duds are sent off to a different factory to be chopped up and made into cigarettes). We were interested to hear that salaries are paid in national pesos with a bonus in CUC (dependent on their output) plus 5 cigars per day. It was fascinating to see how the cigars are rolled and pressed in forms before being bound and wrapped. Different workers each producing just one grade, length and thickness of cigar. I suspect its one of those things that looks very easy when performed by a skilled worker but is extremely difficult to get right, especially as the tightness of the roll is crucial to the finished cigar – quality control have a special machine, developed in Cuba, which measures the airflow through a sample of the production to make sure they will burn well. 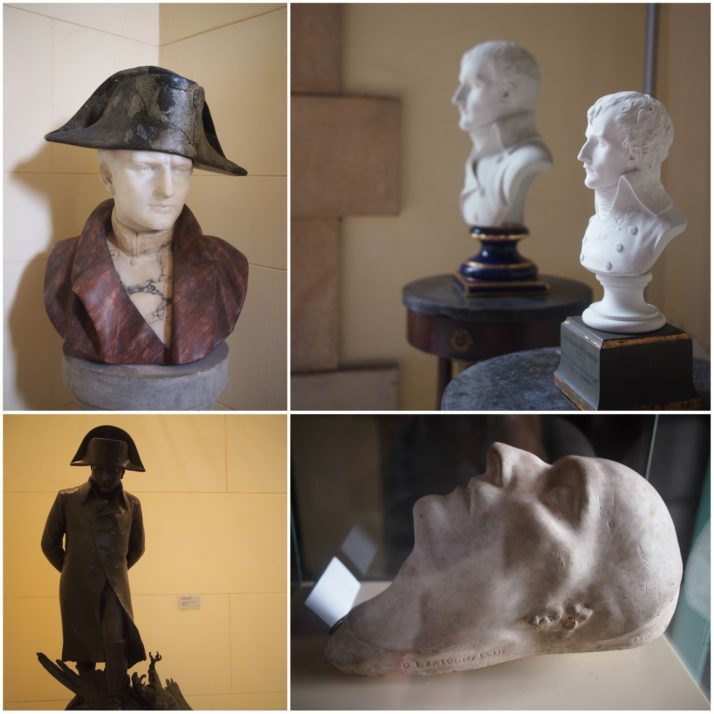 Havana seems a rather unlikely place for a museum of artefacts relating to Napoleon, but here we are, one of the best laid out museums that we visited in Cuba. 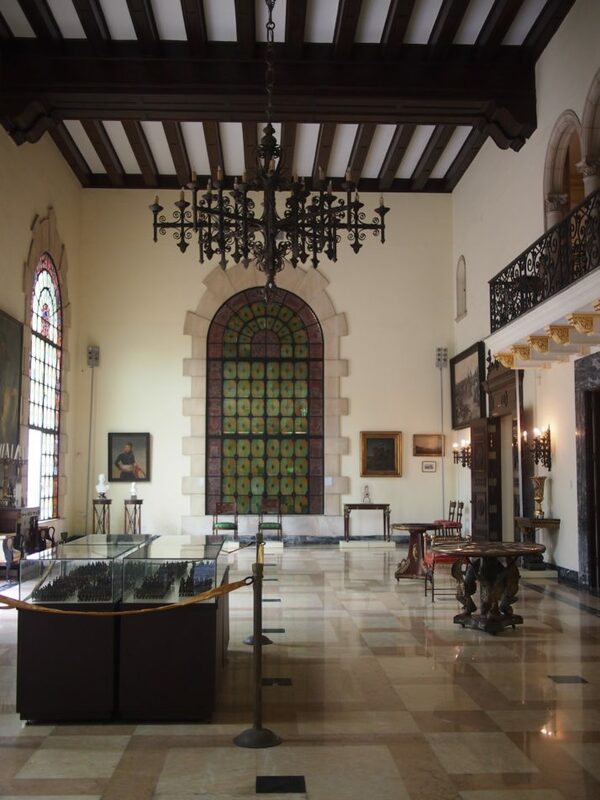 The displays include everything from soldier’s uniforms to period furniture to Napoleon’s pocket watch and were amassed by Cuban sugar baron Julio Lobo. Following the Revolution they were seized by the state and set out in a beautiful restored mansion near the university in Vedado. The museum was fairly quiet and a good way to spend an hour or so – I don’t think it’s on the itinerary of the bus tours – and the staff were friendly. The lovely lady on the second floor in particular spent a lot of time pointing out the various highlights set up in the bedroom and explaining to us the history of the museum collection. This entry was posted in Experiences, Places and tagged Art, cigar, Cuba, Havana, modern art, Museum, Napoleon, rumba, Tour, train on June 16, 2016 by Julie. Many of the big cities we’ve visited on this trip have some kind of discount card which is valid for many of their attractions. They tend to be a really good deal if you want to tick off three or four big name sights during a short visit. Unfortunately for us they’re usually only valid for 1-5 days and we want to spread our sightseeing out over a fortnight or a month rather than cramming it all into just a few days. 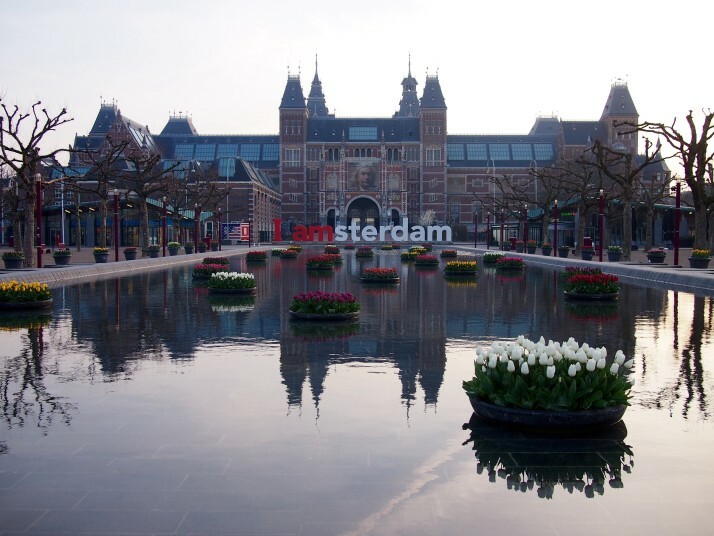 Amsterdam has this option too, it’s called the iamsterdam card and covers public transport as well as entry to attractions for 1, 2 or 3 days. But there’s another option here. 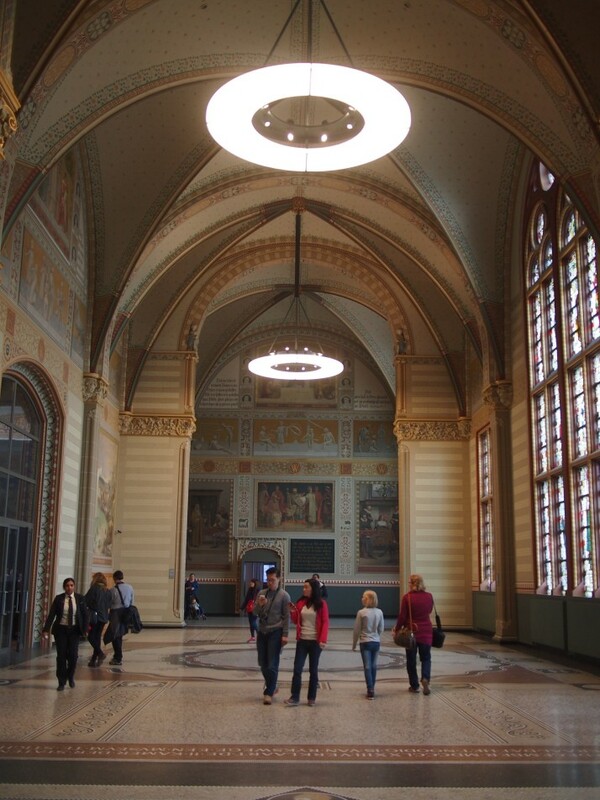 If you’re not bothered about public transport (and it is very feasible to walk everywhere in the centre), the Museumkaart (Museum Card in English) is valid for a full year and allows multiple entries to around 400 museums across the country. 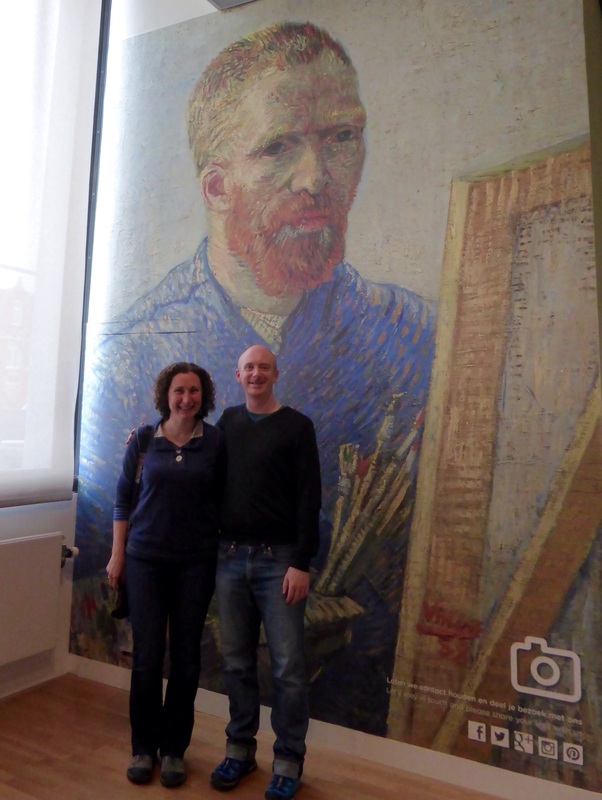 It costs €59.50 and can be bought from museum ticket offices (we picked ours up at the Van Gogh Museum). 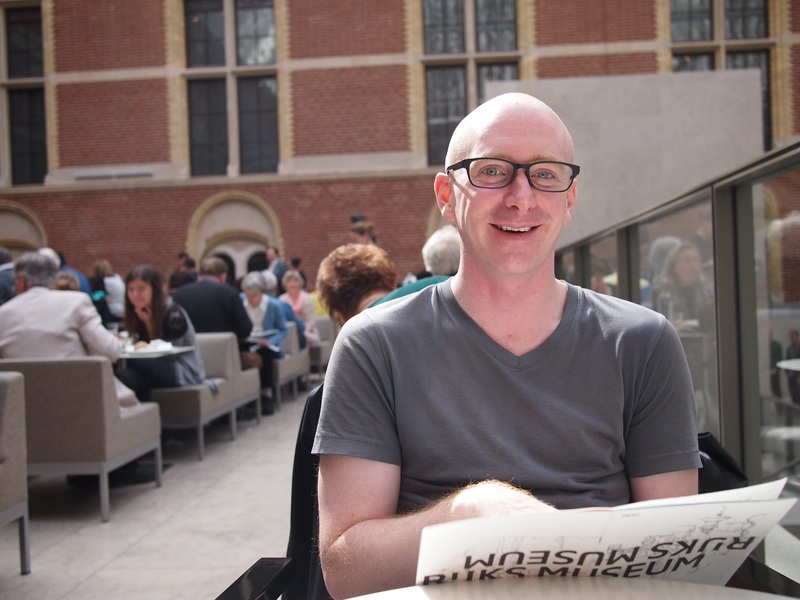 It easily pays for itself after 4 or 5 visits as museums here are pretty pricey. In total we used it for €121.50 worth of visits during our month in Amsterdam, saving over €60 per person. Granted we wouldn’t have visited all of these places if we hadn’t had the card but it allowed us to just have a quick look whenever we were vaguely interested. You’ll never see as many Van Gogh paintings in the same place again as are in the galleries of the Van Gogh Museum. It’s laid out in chronological order and includes paintings by other artists to show how his contemporaries were working and those who were influenced by him, including Monet, Manet and Francis Bacon. We thoroughly enjoyed it and were happy to visit again with Dan, Clare, Scott and Emma. Housed in two neighbouring canal houses the Huis Marseille Museum of Photography is host to a number of temporary exhibitions. 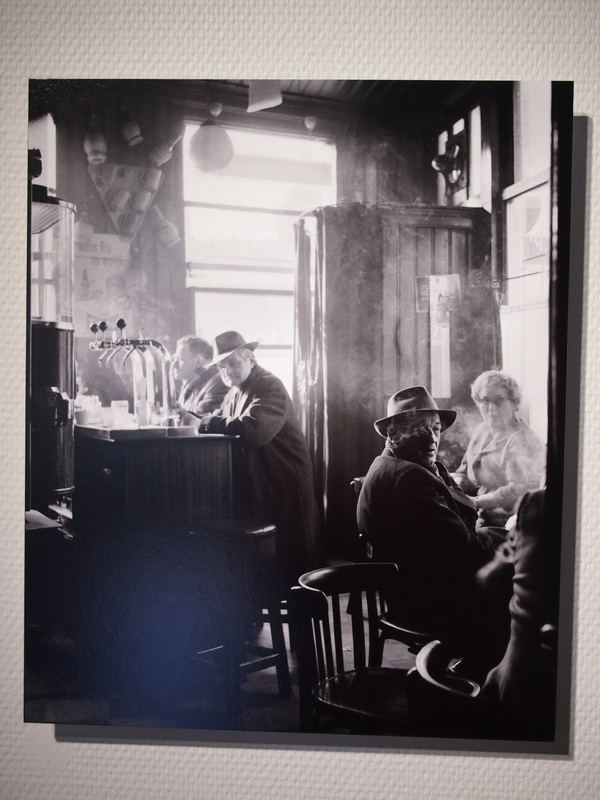 When we visited one was a fascinating collection of pictures from a photographer who had visited North Korea, but over half the space was given over to a retrospective on the life’s work of local photographer Cor Jaring. 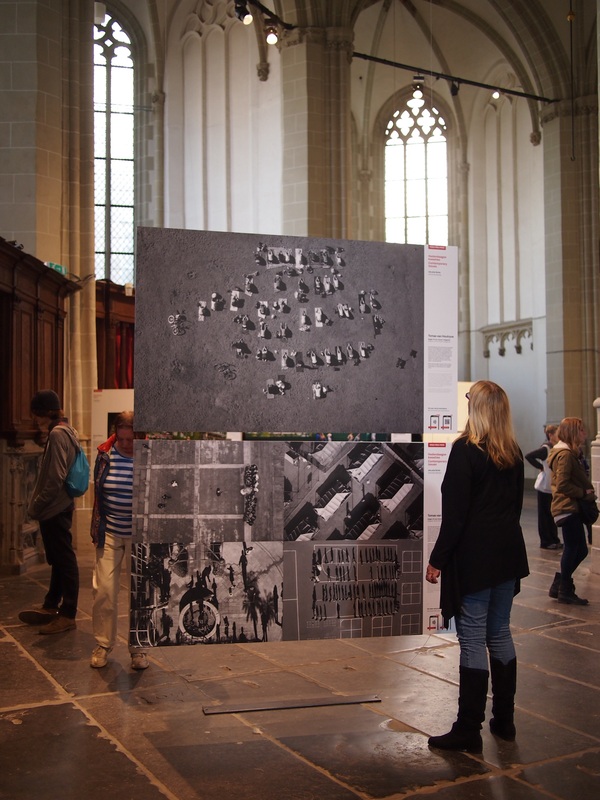 The Nieuwe Kerk (literally New Church) is a former church which is now used for art exhibitions. At the beginning of our month here it was showing a video installation by Bill Viola, and for our final week, the winning images from the 2015 World Press Photo competition. The video installations were quite hypnotic but maybe not something we would have paid to see. Whereas we knew we would enjoy the photographs as we saw the 2014 winners in Tokyo last year. Once again we were stunned by the ability of the photographers to capture the story in the images as well as often achieving something jaw-droppingly beautiful. After wandering beside so many of Amsterdam’s canals and admiring the architecture of the canalside buildings we wanted to have a look inside one. 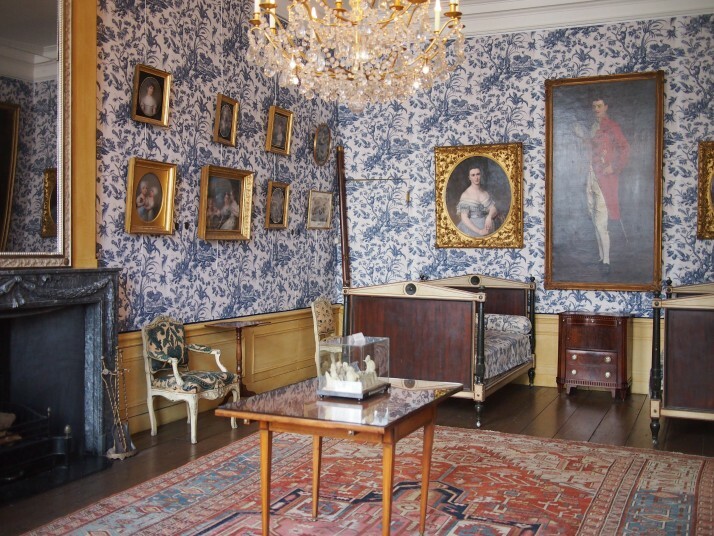 The Museum Van Loon is stilled lived in by the Van Loon family although nowadays they’re up in the former servants quarters and the house’s main rooms have been restored to their former splendour. It was also nice to spend some time in the small garden tucked away behind the house and entirely invisible from the street. 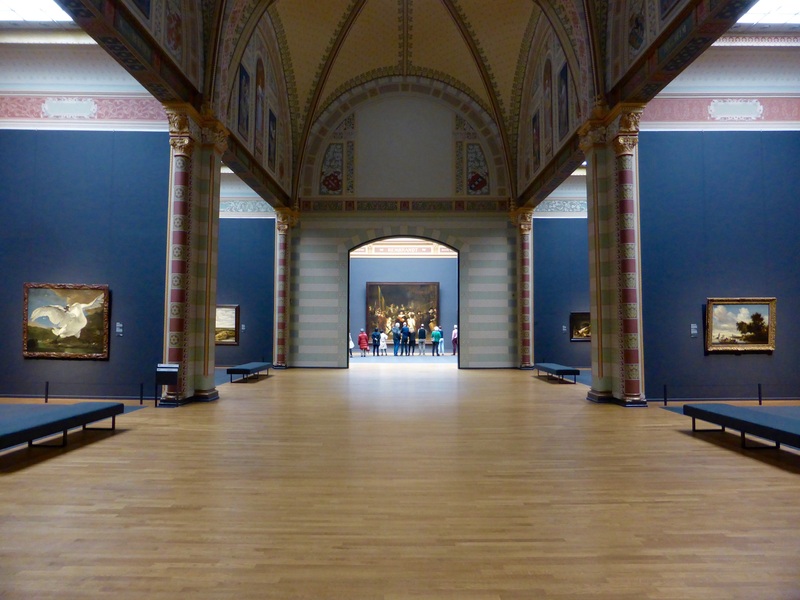 The Rijksmuseum is so huge that it deserved its own post. 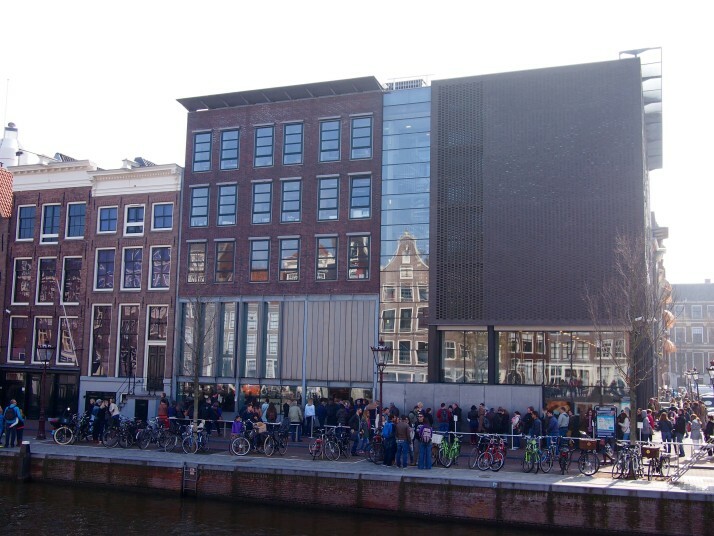 The Anne Frank House is high up on many people’s to-do list when they visit Amsterdam and the length of the queue outside reflects this (seriously it winds all the way through a nearby square and around a church). We managed to avoid the queue by reserving places online the day before (timed tickets seem to be released sporadically so keep an eye on it). The museum is small but well set up for the huge flow of people, telling the tragic story of Anne’s life and how she hid with her family for over two years. It was fascinating to see the secret annexe and learn a little more about the ‘helpers’ who brought them food and news from outside, and one of whom managed to rescue and keep the diary after the arrest in the hope that it could be returned to Anne after the war. The main exhibit of the Stadsarchief (City Archive) is free to enter although it was of limited interest to us as all the captions were in Dutch only. 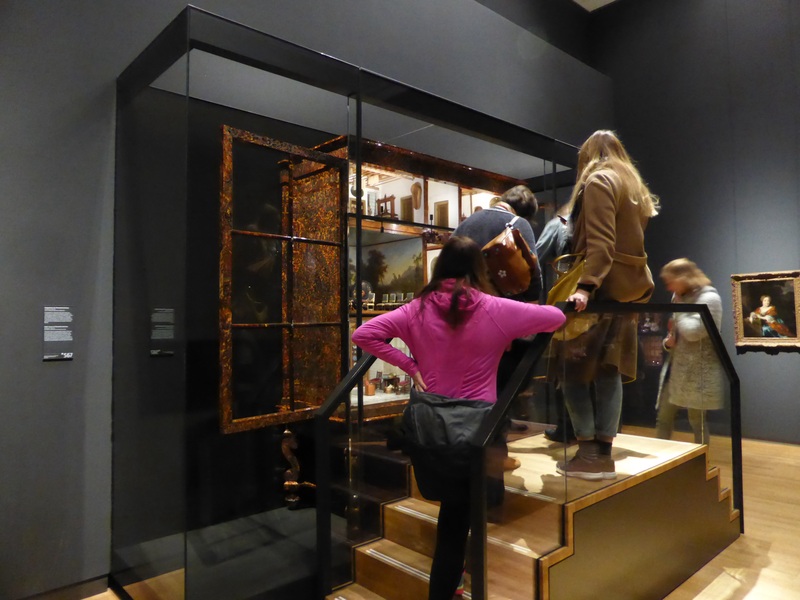 However, the Museumkaart granted us entry to the special exhibit which was a different aspect of Cor Jaring’s work than we’d seen at the Huis Marseille Museum. 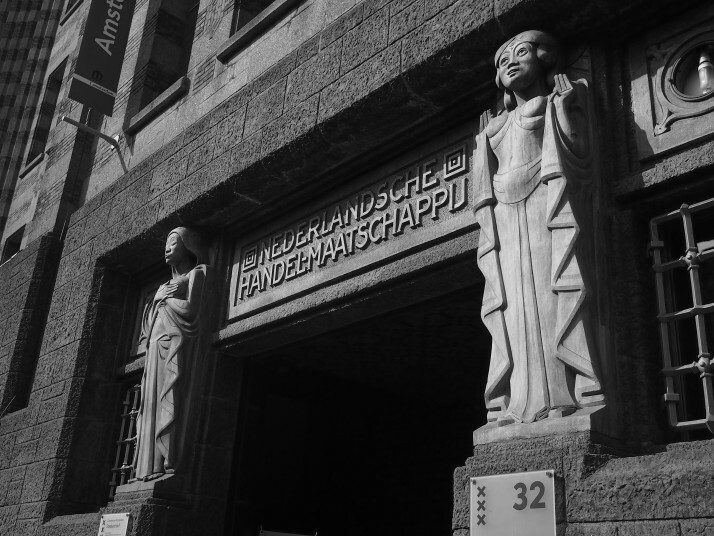 When he died in 2013 he left his archive to the city, and the exhibit here focussed on his chronicling of the cultural revolution which took place in Amsterdam during the 1960s. The building itself is worth a look as it is a former bank and you can see the original vault doors as well as huge leather bound archives in the basement. 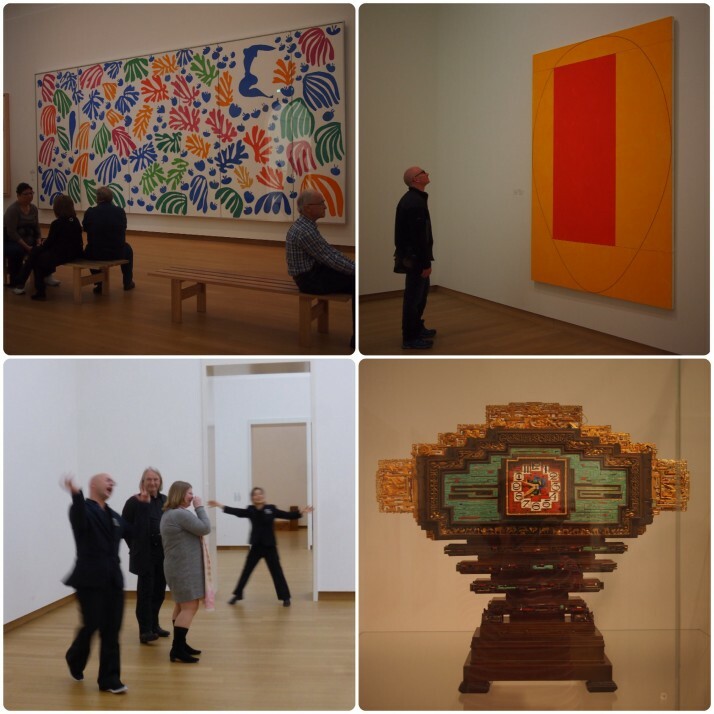 Hosting a special exhibition focussing on Henri Matisse during our visit the Stedelijk Modern Art Museum is the only museum that we had to pay a surcharge (€5) to enter with the Museumkaart. We both enjoyed the Matisse exhibition as it was well set up and liberally sprinkled with works from other major artists (Van Gogh, Picasso, etc.) to add context. The remainder of the upper floor was given over to a large number of works from the second half of the 20th century while the other half of the ground floor contained a selection from the museum’s large collection of design objects. From outside, the Museum Our Lord in the Attic looks like an unassuming canal house, but climb the stairs inside and you find the top three floors have been converted into a church! 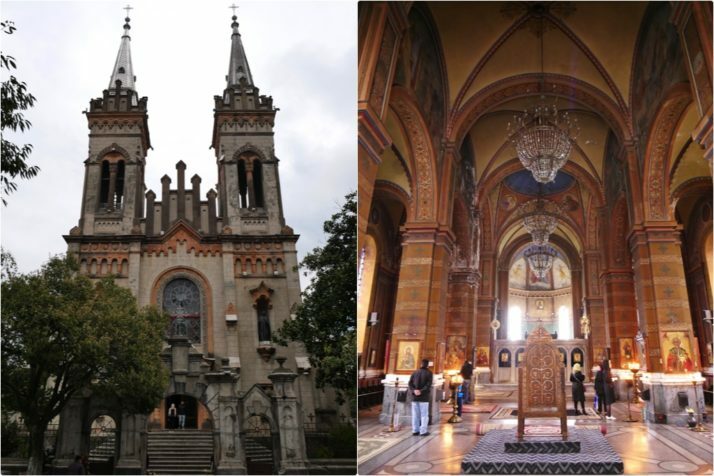 This dates from the 1660s when it was forbidden for Catholics to openly practice their faith and so secret churches like this one were built. 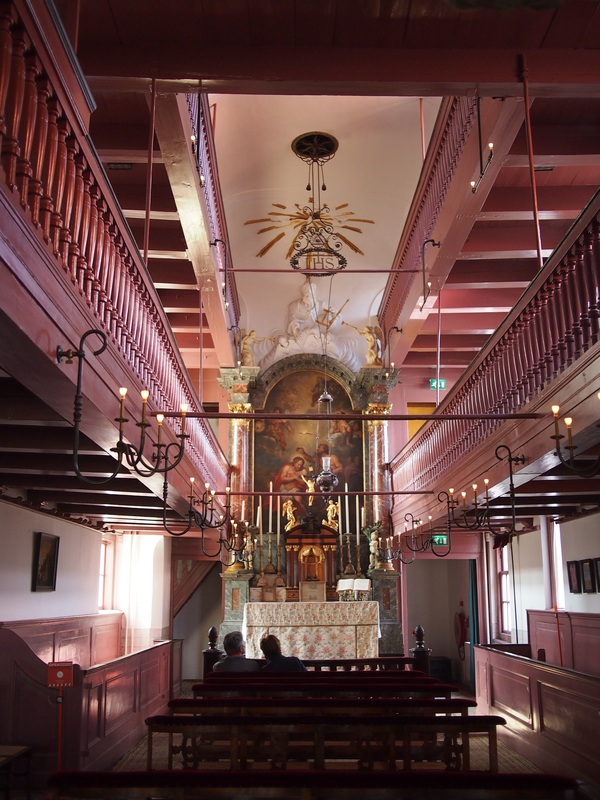 Designed to accommodate 150 worshippers, it was used for over 200 years until the law was relaxed and a new church was built. This entry was posted in Places and tagged Amsterdam, Art, Church, modern art, Museum, Netherlands on April 27, 2015 by Julie. 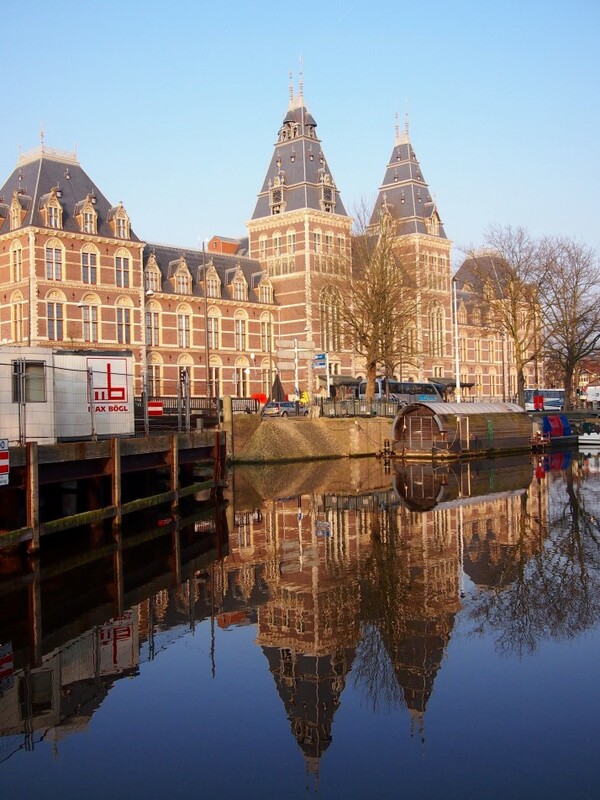 The Rijksmuseum is the Netherlands National Museum devoted to art and history. It reopened in 2013 after a massive, decade long renovation project. The result is an excellent museum, where we happily spent a full day and still didn’t get round everything. Its precursor opened in 1800 in The Hague but that didn’t last long, within ten years it was moved to Amsterdam and in 1885 this custom built Gothic style building was opened in the south of the city. 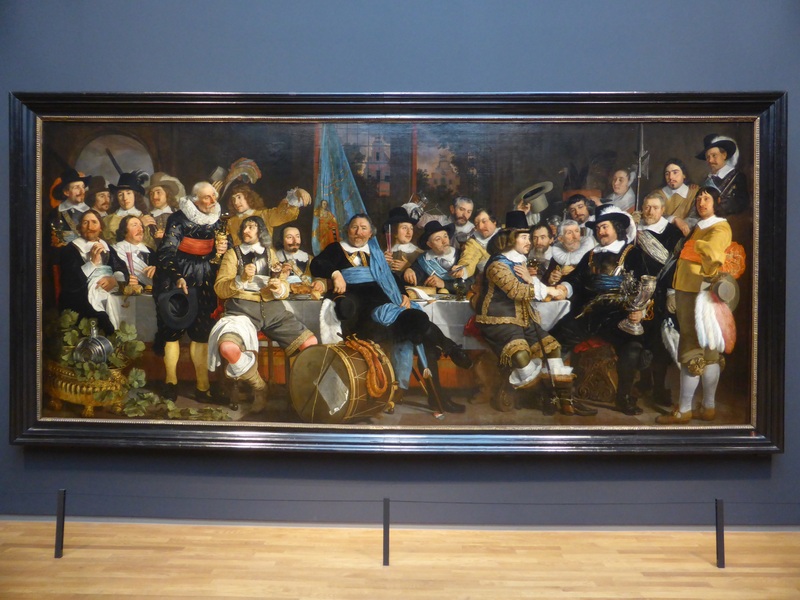 The museum’s centrepiece is ‘The Night Watch’ by Rembrandt. I’d read that it gets very busy around the painting as the day progresses so we headed straight there after the museum opened at 9am. It was definitely the right strategy as we were able to get a good look at the famous picture without the jostling and crowds that we found when we passed back through the gallery a couple of hours later. We’d downloaded the Rijksmuseum’s free multimedia app onto our iPads (it’s identical to the one that you can rent at the museum for €5 so well worth it) and decided to begin by taking the 90 minute tour through the highlights of the 17th century galleries (basically the whole of the 2nd floor). This was the great Dutch Golden Age when the country was one of the world’s trade power houses with plenty of riches to finance high art. During the 17th century it was considered prestigious for groups of civic guards to have a portrait painted. ‘The Night Watch’ is an example of this but my favourite on display here is the ‘Banquet at the Crossbowman’s Guild in Celebration of the Treaty of Münster’ by Bartholomeus van der Helst. The audioguide explained the significance of the painting and also details that we might have missed like the reflections in one captain’s breastplate. The skeletons were still wearing their knitted woollen caps. Each cap was individualized; the men recognised one another only by the pattern of stripes on the caps. The men were bundled up so tightly against the fierce cold that only their eyes were visible. The Rijksmuseum’s library contains around 450,000 volumes and acts as an art history research library. 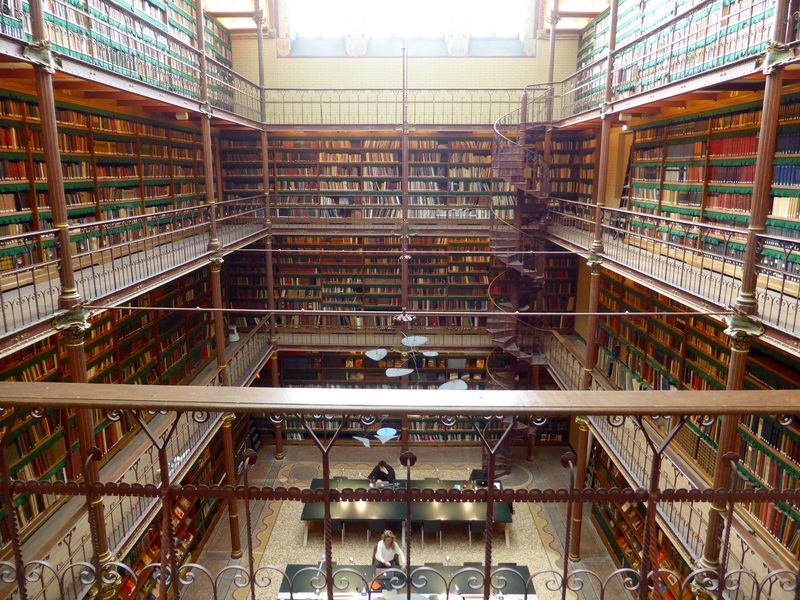 It is open to the public as a reading room and for academic research. While the Dutch men were off trading and conquering the world their wives were left at home twiddling their thumbs. 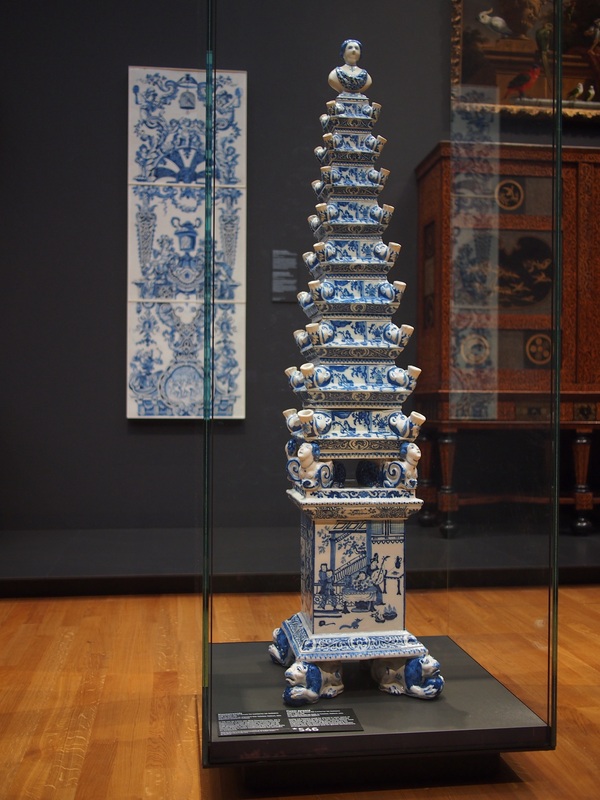 To counteract the boredom (and get through quite a bit of the gold that was piling up) wealthy Dutch ladies furnished doll’s houses which they would then show off to their friends. We were flabbergasted by the detail that went into these, including commissioning a doll sized porcelain dinner service from China! One of the magnificent doll’s houses, complete with working sink in the kitchen! The 17th century was also the start of the Dutch obsession with tulips and cut flowers. 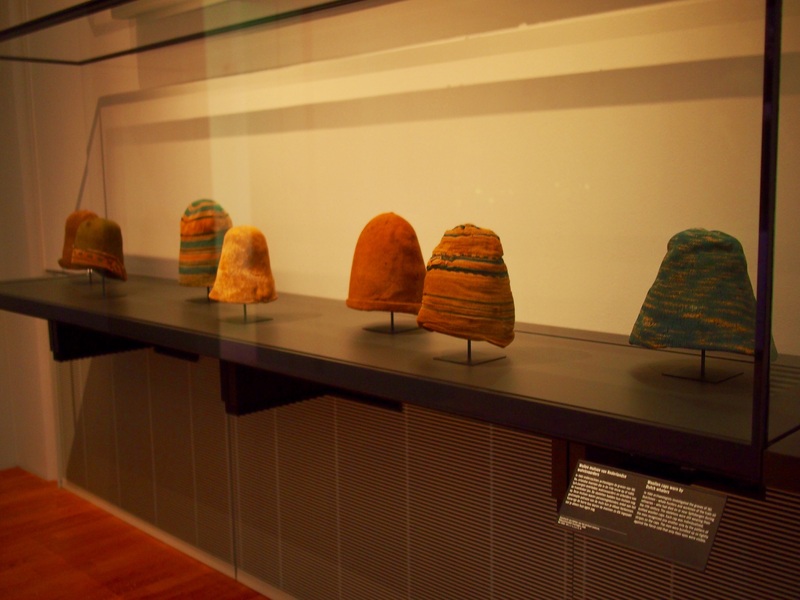 These were very expensive and to show them off to their best advantage they were individually placed in the corners of huge flower pyramids. 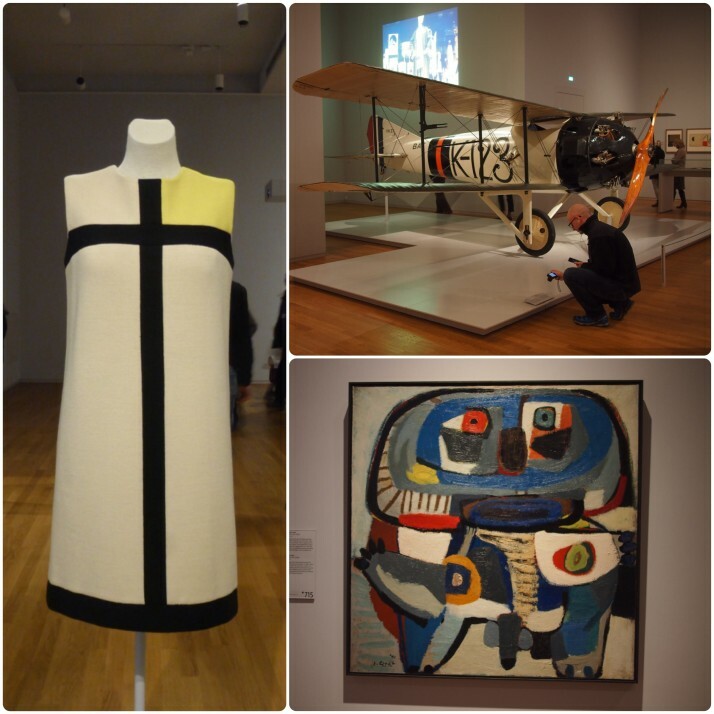 On the third floor is the museum’s small collection devoted to the 20th century. It was much less detailed than the 17th century galleries and heavier on the historical items rather than artworks, for example a Nazi chess set with soldier figures representing the pawns and planes, tanks and rocket launchers for the other pieces, is contrasted with the concentration camp jacket of a Dutch woman who was interred from 1943-45. By this stage we were ready for a rest and so we retreated to the museum’s beautiful airy cafe for a sandwich and a much needed cup of coffee. The building itself is nearly as interesting as the exhibits it contains. The cafe, ticket office and shop are situated in a newly built underground area which was a complex engineering project as it is below sea level. Moving between the east and west wings of the museum necessitates passing either through this basement or through the Great Hall on the second floor as the ground floor is bisected by a cycle path. The renovation project team wished to close this off to link the two sides of the museum, but the bicycle mad public vetoed the plans. 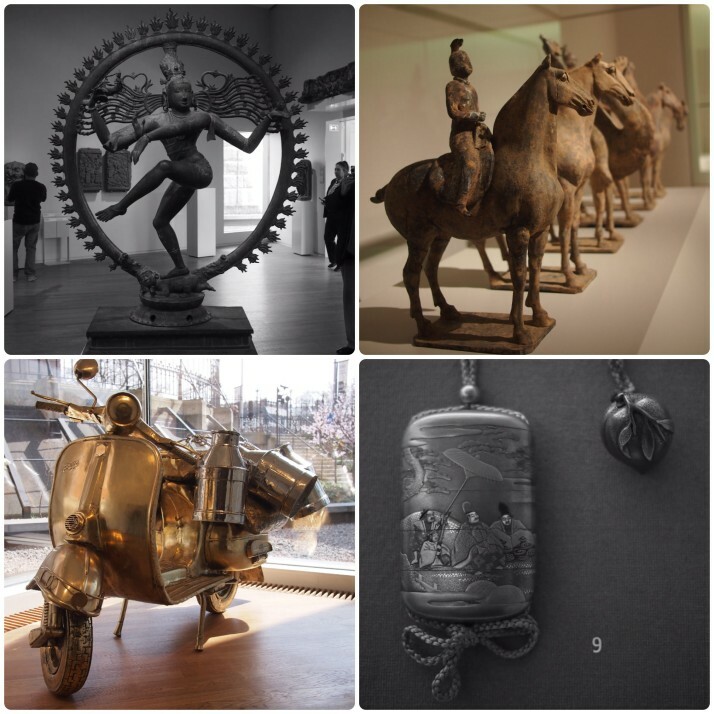 In the Asian Pavilion we found plenty of familiar looking items from our travels – Indian gods, Japanese inro and netsuke, Buddhist temple guardians and Chinese tomb artefacts. 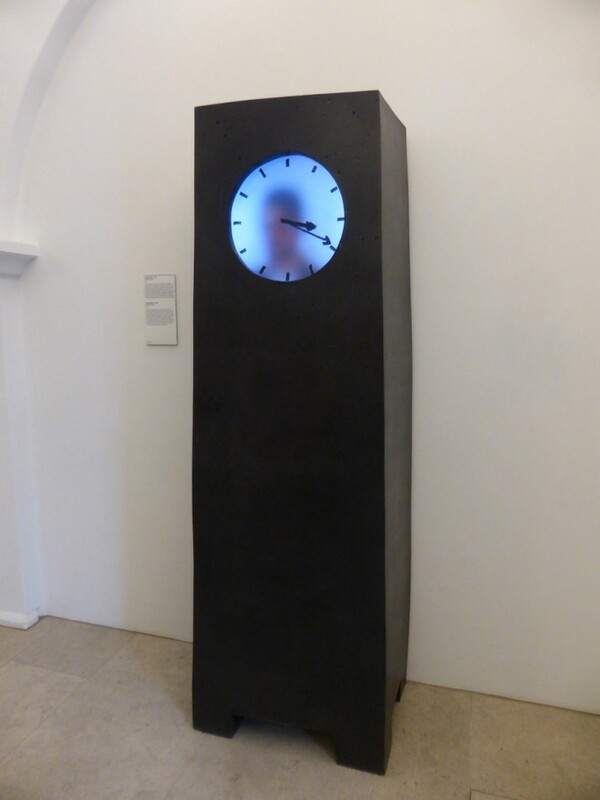 This ‘Grandfather Clock’ by Maarten Baas made us smile. Every minute the “man” inside wipes off the minute hand and draws a new one! 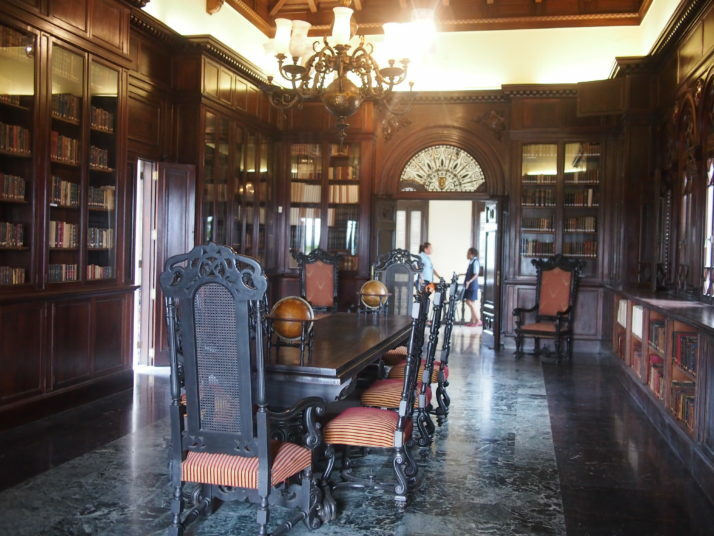 Dutch colonial history is represented throughout the museum but on the first floor is a whole room showcasing items from this aspect of the country’s past. I particularly liked the cannon with a dragon’s head and we both recognised the model of Dejima, the small island to which Dutch traders were confined in Nagasaki. 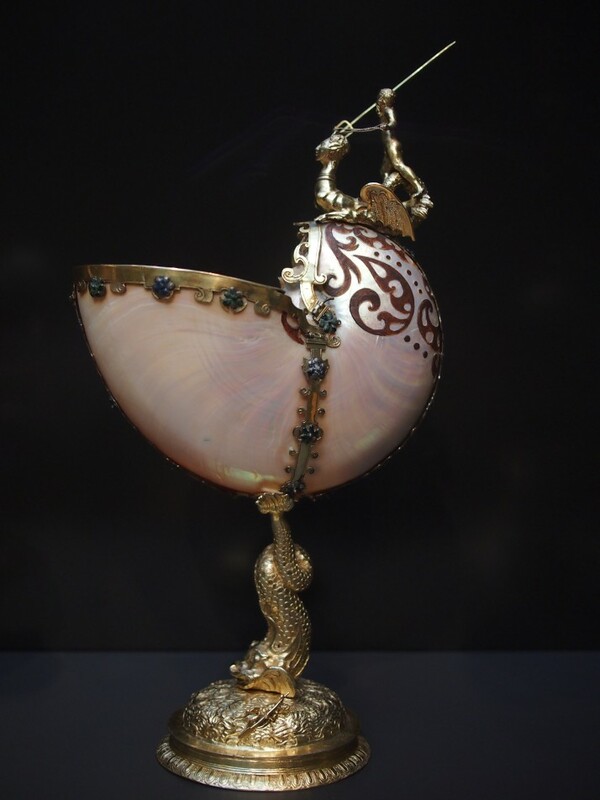 We spent the last twenty minutes of our visit speeding through the Special Collections section, a group of galleries with everything from model ships to dinner sets to fashion and jewellery. Although we spent a full day in the museum we could have stayed for longer. The variety of the exhibits kept us interested and the information about the displays both in the galleries and in the multimedia tour were excellent. 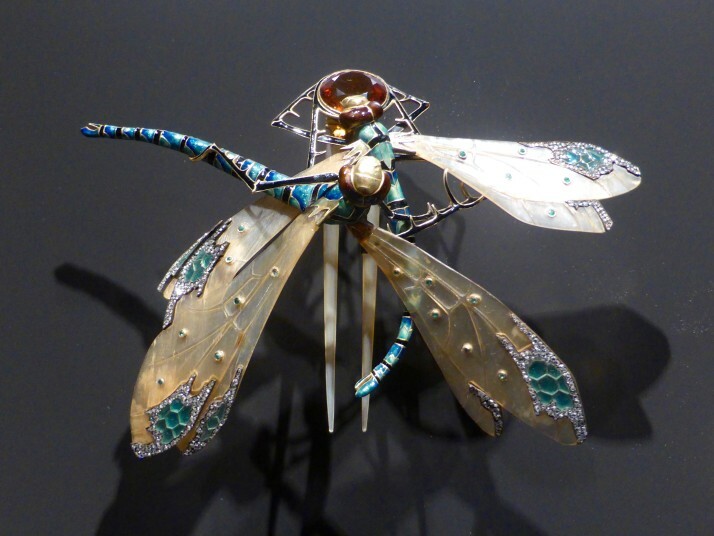 This entry was posted in Places and tagged Amsterdam, Art, Museum, Netherlands on April 14, 2015 by Julie.